It is with great joy that I inform you that on 6th October 2018, it was announced in the Vatican that Mr. Guilherme Vaz has been appointed Consultor on the reconstituted and enlarged Vatican Pontifical Council for the Laity, Family and Life. For 10 years, Mr. Guilherme Vaz was a member of the erstwhile Pontifical Council for the Laity, first appointed by Pope Benedict XVI and continued under Pope Francis. 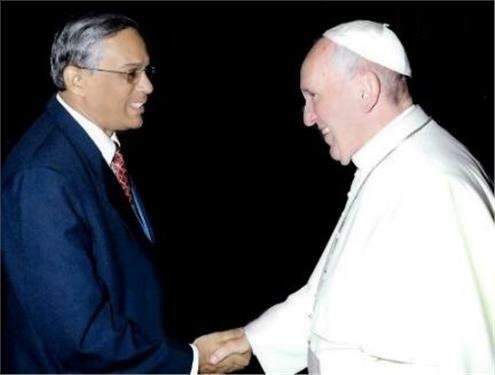 As you are aware, for many years, Mr. Guilherme Vaz has been a close collaborator of The Catholic Bishops’ Conference of India. Initially, as Consultor to the Commission for Education and Culture, he was closely involved in the first ever comprehensive survey of Catholic Education in India and in formulating the Catholic Education Policy that followed. For the last 7 years he is a member of the CBCI Finance Committee and has assisted many individual Dioceses. He is also a member of the Governing Board of the CBCI Society for Medical Education, North India. Mr. Vaz is a member of the Board of Management of Christ University; Hon Treasurer of Indo-Global Social Service Society and is actively involved on the Bombay Archdiocesan Board of Education since its inception 32 years ago serving under 3 successive Archbishops. For almost 25 years, he was Trustee-Secretary of FIAMC Bio-Medical Ethics Centre, Mumbai. At the last plenary meeting of CBCI, you may recall that, on behalf of the CBCI, Mr. Vaz was felicitated by the then CBCI President, Cardinal Baselios Cleemis, on being bestowed the Papal Honour of Knight of the Order of St Gregory the Great, conferred on him in 2016, in recognition of his exemplary and pre-eminent service to the Universal Church and the International Community; for being the first person to address 3 plenary meetings of the CBCI; and for his continued selfless contribution to many Congregations and Dioceses. We are confident that with his versatile combination of outstanding Corporate, Academic, Government, International, Non-Governmental Organization and Catholic Church Institutional experience, Mr. Vaz who is widely regarded among globally respected individuals in the social sector (Education, Health & Environment) with exceptional experience in Large Scale Transformational Change, spread over 46 countries in all continents with diverse cultures and complexities will, through this new appointment, continue to contribute further to the Universal Church and to the Church in India. We send our prayerful greetings and best wishes to Mr. Guilherme Vaz assuring him and his family of our prayers as we entrust him and his new assignment to the intercession of Our Blessed Virgin Mary.